ATHENS, Greece - European Union leaders will convene in Bratislava next week to talk about the future of the beleaguered bloc after Britain’s bombshell decision to leave it. 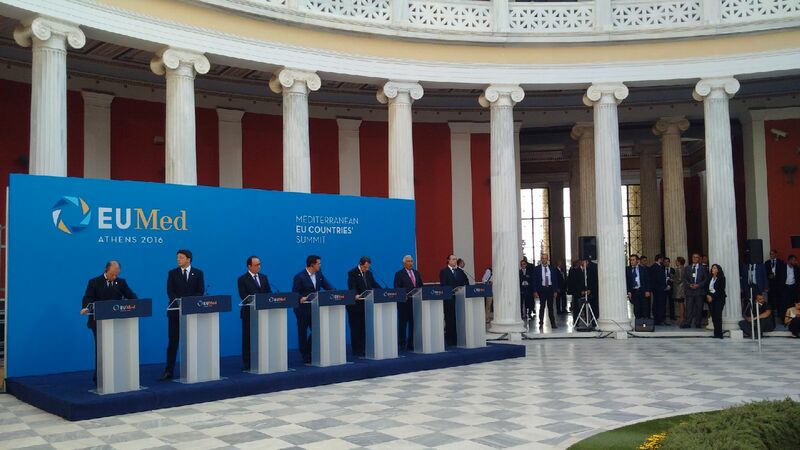 But the leaders of southern Europe stole a march on that summit on Friday, outlining their priorities in Athens. “Europe is at a crossroads. 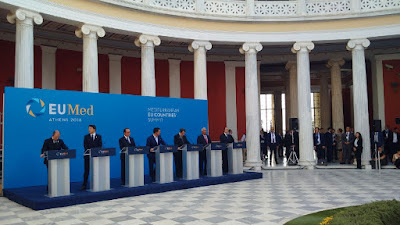 It must re-inspire its people… this requires substantial measures to improve the lot of European citizens,” said Greek premier Alexis Tsipras, who convened the group of seven EU members stretching from Portugal to Cyprus. The Athens Declaration, also signed by France, Italy, Spain, and Malta, calls on the EU to double the size of a $350bn economic stimulus package for the continent. It also calls for a substantial development package for North Africa, to help stem a tide of economic refugees that Greece, Italy and Malta have borne the brunt of. Although this year’s flows have so far amounted to 270,000 people, a quarter of last year’s, there are fears that the numbers could tick upwards again. “Mediterranean countries have faced difficulties on behalf of Europe on the refugee issue,” said French President Francois Hollande. He spearheaded calls to strengthen internal security and Europe’s external border by making a new European Border and Coast Guard operational by year’s end. It is the internal imbalance of Europe, however, that rankles most. Ever since the financial crisis of 2008, the high-deficit south has buckled under pressure from the north to curtail spending and improve its creditworthiness, so as not to undermine the credibility of the euro. The effects of austerity are now reflected in a political divide: the south has gone broadly left of centre, the north right. Tsipras was even more direct in an interview with French newspaper Le Monde on Thursday. “We must decide whether we want a European Union or a German Europe,” he said. Eurozone countries have unemployment of 10.1 percent in the latest figures to be released, compared to 8.6 percent for the EU as a whole, further undermining confidence in the EU’s most ambitious integration project. The south cannot easily match German competitiveness, nor, believes Tsoukalis, will northern countries agree to large handouts to the south. But he does hold out hope that they can be convinced to spend some of their surplus at home. “While Greece does more and should do more in terms of domestic reform … the Germans should also do something to encourage domestic demand in Germany, to encourage public investment in Germany, that may help regenerate growth in Europe. And that will be their contribution,” he says.